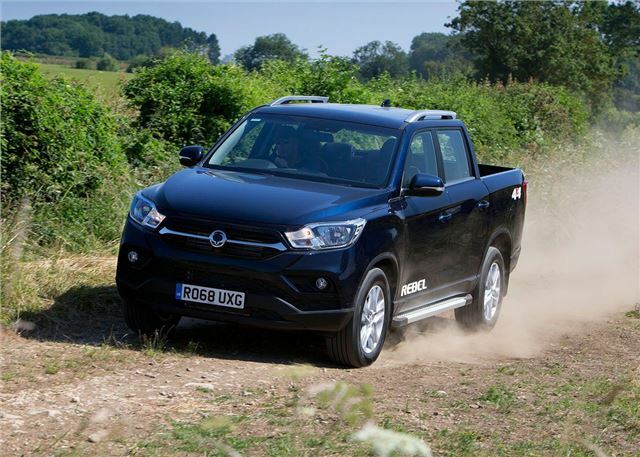 The Musso might be one of the cheapest double cab pick-ups on the market, but SsangYong hasn’t cut any corners when it comes to cabin quality. The large interior genuinely feels upmarket, for a pick-up, with lots of soft touch materials and a modern layout that makes it easy for the driver to get comfortable and settled behind the wheel. Entry level models get DAB audio and Bluetooth phone connectivity as standard, while mid-spec versions of the Musso come fitted with a smart eight-inch touchscreen that features Apple CarPlay/Google Android Auto and a rear-view camera. Spend more and you’ll get SsangYong’s excellent 9.2-inch infotainment with TomTom-powered navigation – a system that’s among the best of any pick-up on sale right now thanks to its easy to use menu system and crystal clear camera display. The Musso doesn't get the option of a single or extended cab, which means all models will accommodate four adults in comfort (or five, at a squeeze). However, while the large cabin provides lots of head and leg room, it comes at the price of a short load bed. Indeed, measuring 1300mm in length and 1500mm in width, the load deck is significantly shorter than the Hilux, L200 and Ranger. Despite its limited load space, a one-tonne Euro pallet will fit in the rear of the Musso. Maximum payloads range from 1085kg (auto) to 1095kg (manual). Access the load area is easy, with the drop down tailgate and all Mussos feature 12V/120W power outlets and rotating load hooks. Only the automatic version of the Musso will tow a maximum of 3.5 tonnes, while the manual version will lug 3.2 tonnes when hooked to a braked trailer. Gross train weight is 6.4 tonnes for a manual and 6.7 tonnes for the auto which means Musso can carry its full payload whilst towing a 3.5 tonne trailer. Tow bar max load weights range from 120kg (auto) to 112kg (manual) and businesses may need to fit a tachograph to make full use of the Musso's load move potential.